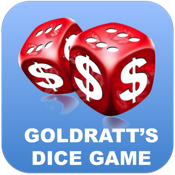 Goldratt’s Dice Game, inspired by a Dice Game created by Dr. Eli Goldratt, author of THE GOAL and creator of Theory of Constraints, was originally designed to help anyone discover the impact of machine output variation and machine dependencies on overall factory output and profitability. The factory has starting Operating Expenses of $70/week. This means if you produce and sell just 10 units/week (2 units/day), your Profit per week will be 10 units x ($20 Price - $10 Variable Cost) - $70 Operating Expense = $30 per week. Do you think you can make a profit after playing for a month?